I. A CREATOR puts loyalty towards his own race above every other loyalty. II. A CREATOR is responsible, productive and constructive. III. A CREATOR places a high value on honor and self-respect, and will defend his own honor, the honor of his race and of his family at all costs. IV. A CREATOR recognizes both love and hate as the two most powerful driving forces in life: that both emotions are healthy and essential to life, and to possess only one and be deprived of the other is to be as crippled as a bird with only one wing. V. A CREATOR realizes that both love and hate, in order to be constructive, must be directed in the proper channels and to do otherwise is destructive and suicidal. VI. A CREATOR therefore makes a careful distinction between his loved ones and his enemies. He loves, aids and abets those of his own race and his own kind, and hates his enemies, namely Jews, niggers and the mud races. VII. A CREATOR is eager, optimistic, aggressive, energetic, and self-sacrificing for the best interests of his people. VIII. A CREATOR strives to keep physically fit and keep his body in the best of health at all times. IX. A CREATOR is inquisitive, adventurous, and has a cheerful zest for living. X. A CREATOR is tough, tenacious, resolute, persistent, persevering, indomitable and indefatigable, as were the Ancient Romans. XI. A CREATOR is practical, down to earth and concentrates on those goals and activities that are meaningful and worthwhile. XII. A CREATOR is brave and courageous and always a proud credit to his people. XIII. A CREATOR places high value on ATTITUDE, strives continually to maintain a healthy, positive and dynamic attitude towards life. XIV. A CREATOR is an Achiever and a Producer. XV. A CREATOR is a problem solver. * Once we have straightened out the White Man’s thinking, the battle is as good as won! * Spread the word-words are powerful weapons. * Nothing is more important than the survival and advancement of our race. 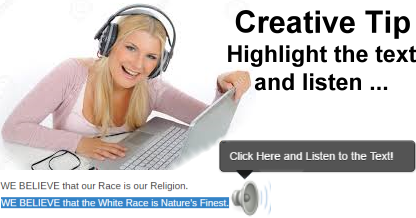 * It is our aim to shrink the colored races, and to expand the White Race. * Civilization is plainly the creation and property of the White Race. * We do not condone tolerance of other people’s beliefs if they are an affront to our intelligence.